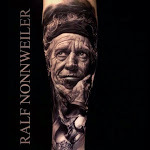 Ralf Nonnweiler from Neunkirchen, Saarland in Germany is originally sprung from a graphic background and has worked for years with portrait painting. To achieve the best quality he always tries to use the highest quality in materials. 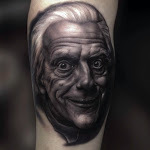 Looking at Ralf’s skills in realistic portrait tattooing there is no doubt he master the skills extremely well for fine details, smooth shading and impeccable lighting and texture effects. When looking at the level of realism in his tattoos there is no doubt that he brought his experience and artistic skills with him from the more traditional art form of painting. 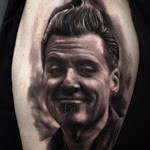 There are a lot of tattoo artists out there that can make a realistic tattoo portrait look great in every technical aspect, shading, highlights, texture, etc, etc. Except one important aspect…the actual resemblance to the original reference! 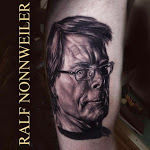 This is why there are few tattoo artists that can make a tattoo portrait of a famous movie character or a music artist etc…that really look like the reference! This is something that Ralf Nonnweiler can do incredibly well. He’s done a number of portraits that is really mind blowing. So take a few minutes and look through his gallery and tell me I’m wrong. Because I know I’m not!